Porcelain veneers are thin porcelain facings that are used to correct dental conditions such as stained or yellowed teeth, gaps, mildly crooked teeth and chips. 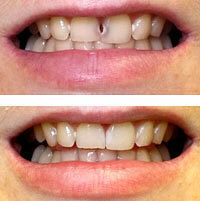 These very natural-looking cosmetic restorations can completely transform your smile. Best of all, your smile makeover can be completed in just two visits of treatment. Our doctors are all experienced in placing beautiful, porcelain veneers that blend in with the rest of your teeth and look completely natural. We use top quality porcelain to create your veneers. Porcelain has a translucency that is very similar to real teeth. This means it looks natural and will blend right in with the rest of your teeth. Our doctors use different types of porcelain, depending on your specific needs. Creating your new smile requires careful planning. We take impressions of your teeth and digital X-rays as needed. Often the doctor will have a wax-up model made for use in designing your new smile. With this wax-up model, the doctor can make adjustments to the size, shape and fit and make sure that your new smile will not only look great, but will be comfortable and functional as well. You and the doctor will work together to ensure that your veneers are just what you wanted. Part of this is making sure the size and shape of your veneers are right for your face and complement your features and personality. The doctor is even able to choose the shade for your new veneers so that they look natural and blend in with your other teeth. Many problems with the teeth can be fixed with dental bonding. Dental bonding is sometimes used for many of the same purposes as veneers. It’s a tooth-colored composite resin material that is applied directly to the tooth to augment teeth, such as in repairing chips, or to cover teeth, such as to whiten discolored teeth. It requires no anesthesia and little tooth preparation. Dental bonding is more economical than porcelain veneers but is less durable and can stain and become discolored easily.